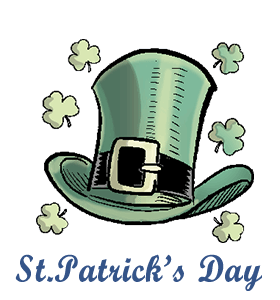 ﻿Saint Patrick's Day: Calendar, History, Tweets, Facts, Quotes & Activities. St. Patrick's Day is a celebration of Irish pride and heritage. Saint Patrick was a British-born priest and former slave who is known for converting the Irish to Christianity and chasing the snakes out of the country. He died on March 17, in the year 461 and was mostly forgotten. As time passed, stories grew around St. Patrick and centuries later he was honored with the title of Patron Saint of Ireland. Over the years, big parties and the custom of drowning the shamrock at the end of the celebrations - a shamrock is placed in the bottom of a cup that is then filled with whiskey, cider or beer then drank with a toast - have become increasingly popular all over the world. Every year, on March 17th, this holiday is celebrated around the globe with shamrocks, leprechauns and lots of green. Approximately 5.5 million pints of Irish Guinness stout are consumed on an average day. On St. Patrick's Day, nearly 13 million are consumed. Wearing the shamrock, a three-leaf clover is a St. Patrick's Day tradition. The official three-leaf clover is known scientifically as Trifolium dubium however clovers can also have more leaves. Four-leaf clovers are said to be lucky, however the odds of finding one are about 1 to 10,000. Wear green! In some parts of the world, the custom is to pinch people who aren't wearing the color of shamrocks. Attend a St. Patrick's Day parade. Major cities like Chicago, New York, San Francisco, Dallas, and Boston host marching bands and floats. The heart of any Irish neighborhood is its local pub. Share a couple of green Guinness beers with friends at a local Irish pub or try Magner's (Bulmer's) apple cider as an alternative. St. Patrick was a brave and humble man. Have you been putting off something because you are afraid to do it? Do it today in honor of St. Patrick's day. Enjoy a traditional Irish meal. A traditional Irish St. Patrick's Day meal would include roasted leg of lamb, carrots, parsnips, peas and lots of potatoes!